The Federal Reserve began its two-day monetary policy gathering Tuesday, with analysts expecting the central bank to announce a quarter-point rate hike. Fed officials are grappling over how much more monetary tightening is necessary to keep the economy (and inflation) healthy. U.S. government debt yields continued their upward climb on Tuesday as the Federal Reserve began its two-day policy meeting. 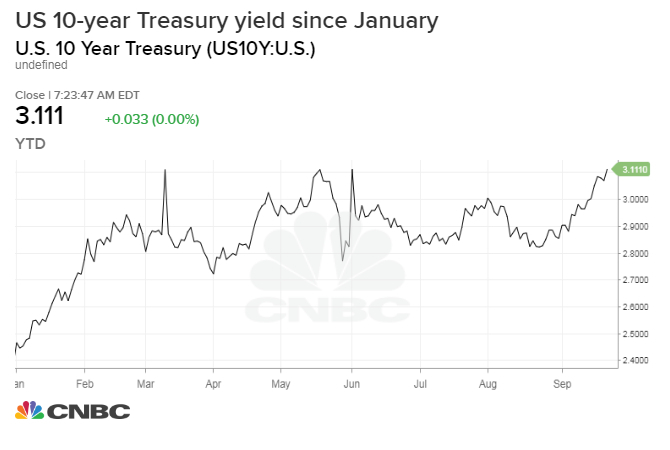 The yield on the benchmark 10-year Treasury note touched 3.113 percent , just shy of its 2018 high of 3.128 percent that it hit in May. The yield on the 30-year Treasury bond hit 3.249 percent earlier in the session, its highest level since May 18. The yield on the two-year note, meanwhile, rose to 2.847 percent, its highest since June 25, 2008; the five-year rate hit 2.99 percent, its highest since June 11, 2009. Bond yields move inversely to prices. The 10-year yield was last seen at 3.096 percent, while the 30-year yield was at 3.227 percent at 3:34 p.m. ET. The Federal Open Market Committee began its two-day monetary policy gathering Tuesday, with analysts expecting the central bank to announce a quarter-point rate hike when it concludes its meeting tomorrow. The hike will push the funds target to 2 percent to 2.25 percent, where it last was more than 10 years ago. The event will also be watched closely to see if the Fed provides any signals as to where monetary policy will be heading over the coming months and into next year. "The market is fearful that dovish hikes are a thing of the past ... Markets are finally respecting the Fed, and are starting to think that these guys mean business," said George Goncalves, head of fixed-income strategy at Nomura Securities International. "I'll be watching to see if the Fed's happy with the market's reaction [to its hiking cycle]," he added. Members of the FOMC are grappling over how much more monetary tightening is necessary to keep the economy (and inflation) healthy. Up until now, most officials have been comfortable with the Fed's slow-and-steady rate hikes and unwind of its massive balance sheet. A flattening of the so-called yield curve has some market watchers nervous as spreads between short-term and long-term debt rates shrink to lows not seen since before the 2008 financial crisis. An inverted U.S. yield curve — where short-term rates surpass long-term rates — has frequently heralded upcoming recession. As of the latest reading, the spread between the 10-year note yield and the two-year note yield was 26 basis points. The Bank of Japan released the minutes of its July policy meeting Tuesday. In the release, some policymakers said that the institution should consider the potential risks of ultra-easy policy at a more serious level, Reuters reported. On Monday, European Central Bank President Mario Draghi warned of stronger inflation, saying in a speech that underlying inflation was expected to "increase further over the coming months as the tightening labor market is pushing up wage growth." The news sent the two-year treasury yield hit a high not seen since 2008. The Treasury Department auctioned $38 billion in five-year notes at a high yield of 2.997 percent. The bid-to-cover ratio, an indicator of demand, was 2.39. Indirect bidders, which include major central banks, were awarded 57.9 percent. Direct bidders, which includes domestic money managers, bought 9.2 percent.